We lived on the east side of Stockton off Harding Ave (not Harding Way) and my stepdaughter was the only one home with her two daughters. When her two daughters were taking pictures playing around with her cell phone and my stepdaughter kind of glanced at her phone and saw one weird photo but kept getting ready because she was late to where she had to go. When she went back to look at the picture. It looked like a ghost, the weird part was that there was an after and before pic of this and the image wasn't there but in this one. Also my uncle's friends knew the people that lived there before and they had told him that a young man around his 20s had died in the home. That photo is scary. There is black encircling the person in a very negative way in my opinion. I think everyone should pray for lost souls to go to God and ask God to bring them home to him and to protect all of us on earth from negative entities that might be evil. 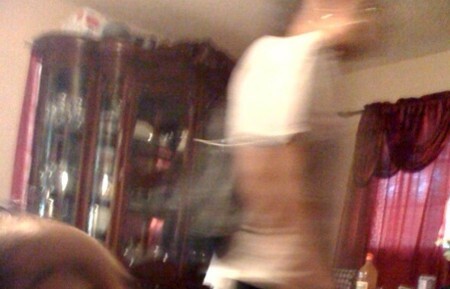 It looks like someone, with long dark hair, just walked by the camera and ended up blurry. Note the dark area going down the top and back of the head, and how that aligns� with the dark area on the back, like hair would and how the lower dark area flips out, like hair would. Also the person appears to be wearing earrings.